feeling stitchy: Hello from Craftster land! Hi from the land of crafty goodness known as Craftster! 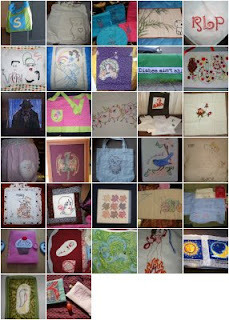 So much has been happening on the needlework front. We had a wonderful needlework swap that just finished up. The items crafted were amazing! There was such a wide variety of talent represented. I'm sure many of you recognize many of the pieces of work. But that's not all that has been going on. We are having our summer needlework/embroidery challenge going on until August 5th. The theme this season is, "Your Favorite Quote Sampler". It could be from your favorite movie, a wise thought from a family member or just something you say all the time. Prizes include scissors, floss, tea towels and a few other goodies thrown in. Hop on over and check it out. something of mine is on here. Something I received from Kittykill is here too..Look at all the crafty ladies!